The Kearney Center in Tallahassee will provide anyone who is hungry a nutritious meal 3 times a day, 365 days a year. Every day, we are serving over 750 meals to those experiencing homelessness and our neighbors. If you know someone who is hungry please let them know about our Food Service Program. Our kitchen will be able to accommodate those requiring special dietary needs. Meals are prepared and served in a clean and safe kitchen with a dining room environment to promote dignity and fellowship. Anyone interested in volunteering in the kitchen can send an email to Bill.Schack@cesctlh.org. We are always looking for Volunteer Meal Groups from our community. Please consider organizing a group and help improve the lives of those who use The Kearney Center one meal at a time. As a Volunteer Meal Group, you will immediately see the impact of your generosity in the grateful faces of the men and women who walk through our serving line. A warm meal, a safe place to sleep, and caring support from staff and volunteers – these simple things transform lives every day. 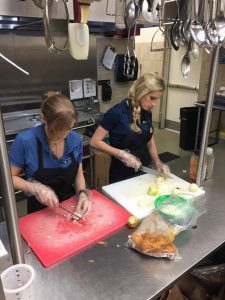 Volunteers will be required to practice safe food handling, food storage, sanitizing procedures, and proper hand washing while working in kitchen. No food handling certification will be required of volunteers. *Volunteers must be 16 years of age to work in kitchen.